Hello everyone. I have finally decided to post my design for a simple, high value 2.1 system that can be adapted to many uses. It uses all Parts Express available parts and is only $300 for everything including speakers, amp, boxes, terminal cups and XO parts. The only thing you need to add are paint (or veneer) and wire. 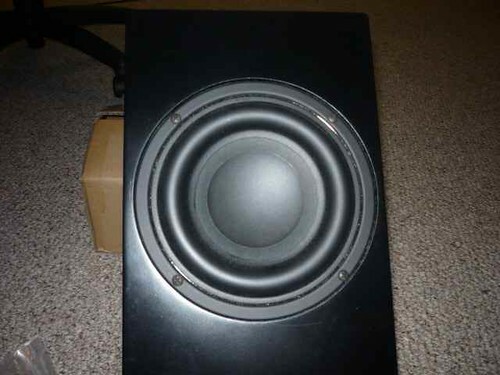 These speakers resulted from a free pair of PE's 0.04 cu.ft. KD boxes that I got from Paul W. after he "won" them at the Scott Q's SEC DIY event in late 2012. He didn't have a use for them, but I thought I could use them, so I asked if I could have them and he gave them to me. After a little thought, I came up with this design. It uses the new DS90-8 budget speakers and a ND16 tweeter. To this I added another PE Knock Down 0.23 cu.ft. box, the PE 2.1 plate amp and a Tang Band W6-1139 SIF woofer. This shows both 1/3 octave smoothing and one octave smoothing together. Darn near flat from 40 to 20k. Now here is where I add my confession. I did not use XO design software. This is a case where I just measured individual speaker responses and applied XO parts as needed. I used a good dose of experience and some help from "textbook" notch filters. But I think you can see that the results were spot on. For now, this is the only XO diagram I have. I hope you can read it. I will try to come up with something more "professional" a little later. The object was to use off the shelf parts and as few as possible to get the job done. Space is very limited in these tiny boxes, so everything had to fit, so that's why I used PE's project box circuit boards and 5 rather than 10 watt resistors. After all, the amp is "just" 20 watts per channel. But this is more than enough and drives these little boxes as loud as I want. The name is simply an acronym for Part Express Desktop Speakers. I had originally intended for them to be desktop speakers, but they turned out so good, that I use them on freestanding speaker stands as my everyday drivers in my home office. I have used them probably eight hours a day for nearly a year now and made a few minor updates. They run off the headphone output on my laptop, so nothing else is needed. I haven't tried it yet, but I guess you could run them off your phone if you wanted to. The XO diagram shows you the original XO and also the optional L-Pad options for the tweeter. At this point, I am using the +1 and 1/2db option which I find gives it the best response in my room and with my old ears. As I go along on this build thread, I'll explain my choices. But if you are interested, the KB boxes are all on sale now, so grab them if you think this would fit your needs. I'll post a full parts list in a day or so when I have the time, but I used PE's project box circuit boards to keep it simple and I used all PE XO parts. I hope someone will build these with the veneered boxes they deserve. I have a couple of other speakers in development, but I keep coming back to these for everyday use. They are exceptionally neutral and image well beyond what I expected. And now as they are fully broken in, the level of detail is simply amazing for the price. But what really does it for me is the bass. The bass bin is so small that you can hide is virtually anywhere and the Tang Band woofer is a wonder. 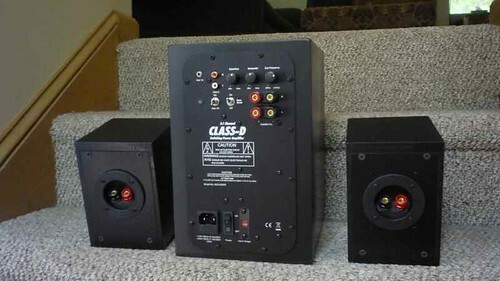 I was blown away when I heard solid 40 hz bass from this shoebox sized woofer. The bass boost on the amp is a perfect match for the sealed woofer. I used to think that a 60 hz cutoff was sufficient for a stand alone box, but this changed my opinion. I now think that you either go to 40 hz or you are not hearing what you need to. Let me know what you think. That's all the time I have tonight, but I will answer questions as I can and post more details later. I hope this is something that will fill a need for some of you. p.s. As always, this is free for non-commercial use, but commercial use requires my permission. Nice looking project. I admire your crossover design approach. It's definitely doable, but so rarely does anyone actually design without software anymore simply because it makes everything so much easier... sort of like when you see someone do joinery by hand instead of using power tools, it's impressive. 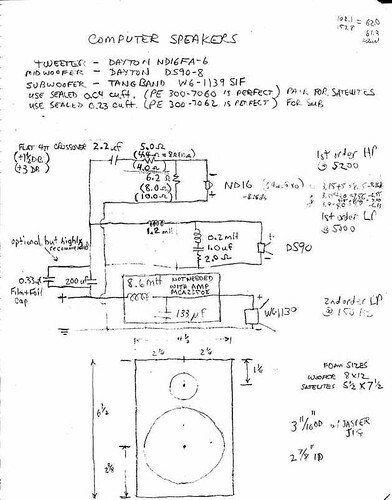 I'm having hard time reading the schematics. Do you have a higher res version? Thanks, Paul. I improved the XO picture above so its a little more legible. The XO is pretty straightforward. It uses simple 1st order electrical filters. 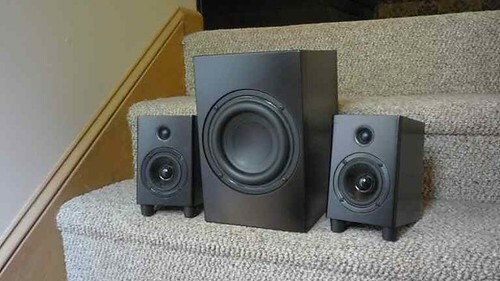 But with only the notch filter on the woofer, the natural rolloff became very close to a 1st order low pass at about 5k. Adding the inductor to correct for baffle step also increased the acoustical slope to 2nd order at about 4.5k if I remember. The same thing happens with the tweeter. It is slightly horn loaded, so again a simple capacitor was all that was needed to get its high pass to 2nd order acoustical. Thus, the need to reverse the tweeter connections. 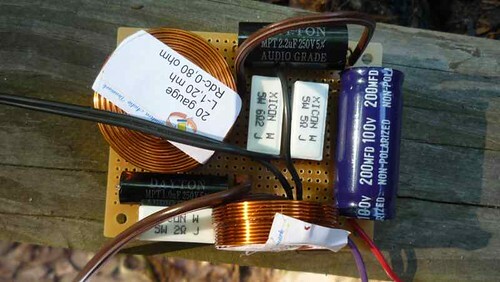 Following the capacitor is a simple L-Pad to bring it down to the level of the woofer. That all worked very well, so I'm not sure how much actually modeling it in software would have improved it. 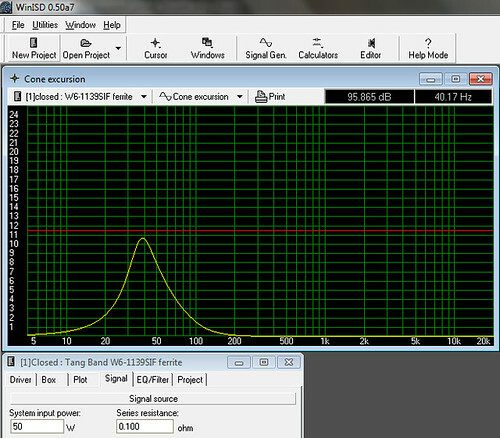 With the tweeter connected in phase with the woofer, I got a nice notch of about 20db - not perfect, but close enough using standard values. 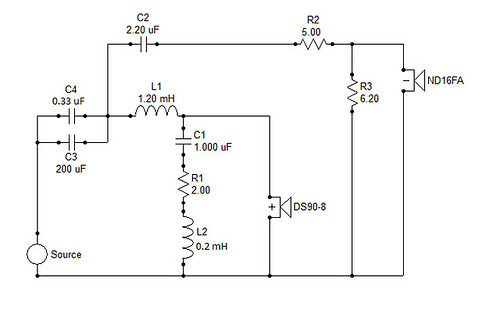 The other feature of this XO is the input high pass created by the large 200uf capacitor. I added this to provide some protection to the woofer from overexcursion. This creates a high pass at 65hz, so its low enough not to affect the low end roll off, but high enough to limit excursion. I bypassed it with a 0.33uf film and foil cap and this did seem to improve definition, so I kept it. This cap combination is optional, but I've used it from the beginning, so I don't know how removing it would affect things. I also didn't want someone to build these and blow them up using them full range. BTW, the feet are necessary to align the acoustical centers of the drivers. Looks like a great project. That is just about exactly what I was looking for when I decided to build Lee's Minion III's and Pauls Voxel Sub. How do they sound? are the clear and detailed? How would you describe them? Also will you be able to post a clear crossover, perhaps a diagram that shows layout and hookups? I plan to provide a better diagram shortly, but the one in my notebook that is attached is what I worked off of. I also have pictures of the XO and will provide a wiring diagram too. I was pleasantly surprised at how neutral these little woofer are. Just like their spec sheet, they are dead flat from 150 hz to about 3000hz. Once you correct the cone breakup with a notch filter, the high end roll off is very smooth and easy to work with. 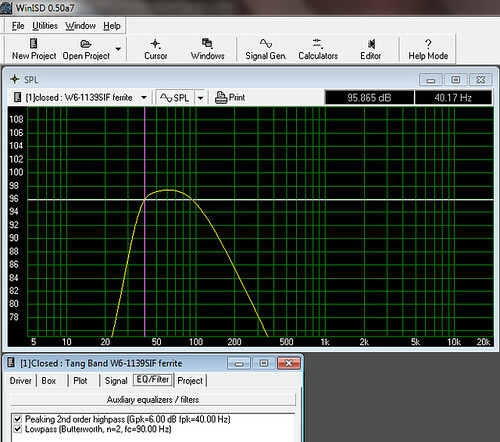 It is down about 6db at 5000 and matches up with the little tweeter almost perfectly. I lost my original measurements, but I plan to take them apart again and post some individual driver measurements later. Being small speakers, they image very well. I'm also working on an 8in 2way with the ScanSpeak discovery woofer and an SB Acoustics dimple dome tweeter. At this point, the PEDS are the better speakers. Maybe I will get the Scans up to the same level, but so far I haven't. The Scans sound boxy in comparison and the SB tweeter doesn't do the details as well as the little ND16. Go figure. The PEDS do have their limits. At full power, you can hear them stressing a bit. But after all, I didn't intend these to be auditorium fillers. I also compared them directly to my brother-in-laws $10,000 Wilson WATT Puppies and, well, the Puppies won. But even he said mine were "close enough to make you wonder what all the fuss is about with expensive speakers." But compared to the very best drivers, these do lack a bit of definition that the better drivers provide, but what do you expect for $16? Thanks Bob - this is exactly what I've been thinking about recently. Something smaller than the Overnight Sensations (4.5L), but larger than the Minions (.5L?). sir, I just try to read and learn. this c-g-d-a-e-b-f-c thing, is this some riff I should know. Bob, so you have a LP on the sub? isn't there already a built-in LP on the 2.1 plate amp? Looks like a great dorm room setup. 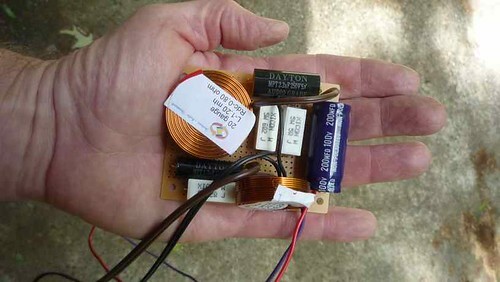 I had been building Wolf's Rubycks + Biumph sub, but might give this a shot in the future (since the Rubycks are NLA). Sorry about that. It is confusing. No, there is no separate LP filter on the sub now. I did the XO diagram based on my initial tests where I used a LP filter on the sub and ran everything from one amp. Once I added the plate amp, I eliminated the LP filter on the sub. 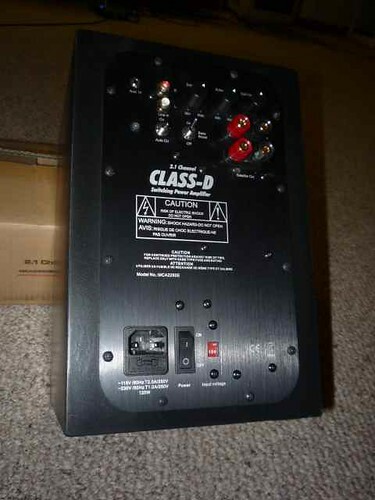 The sub is wired directly to the plate amp and uses its built in LP filter. 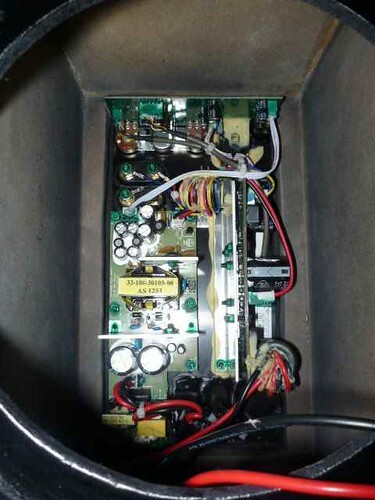 The satellites are run separately from the speaker terminals on the plate amp as you would expect. Its hard to read in the picture, but I drew a box around the LP filter for the sub and put in a note saying that is was not needed when the amp was used. So disregard the LP filter on the sub section. A quick note on the plate amp. From what I could tell, the bass boost circuit is actually a 6db boost at 40hz. The spec say 3db at 63hz. The actual filter does boost 63hz by 3db, but is also boosts 40hz by 6db, so the spec are, I guess, correct, but a bit misleading. 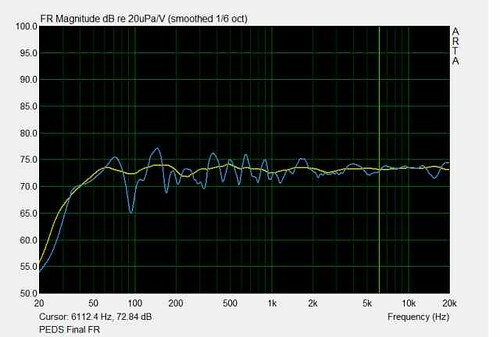 You can model the woofer in WinISD using the "peaking 2nd order high pass" using 6db at 40hz and it matches the measured response exactly. You can also turn off the bass boost and measure and, sure enough, the output in the low 40hz range is indeed 6db lower than with the boost enabled. Also, the specs on the plate amp say it has a built in HP filter set to 150hz. But from what I can tell, it looks more like an 80hz HP. I haven't looked closely at that part yet, but if so, this is good. OK, here are a few words about the sub and the WinISD calculations to back it up. 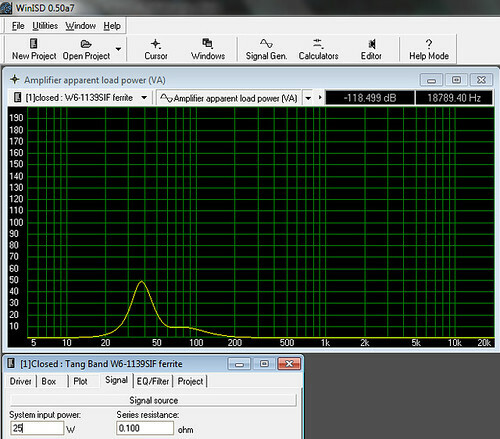 So the moral of the story is that the PE plate amp will give you an SPL of 94db and keep you well under X-max. But if you want to build this same box with a regular sub amp that's 100 watts or more using the same bass boost, you can get a 3db increase in SPL and reach X-max. In this design, I was willing to forego the extra 3db of SPL to keep the sub unstressed and simplify the build to use the 2.1 plate amp. 94db is plenty loud for most normal use and would push the limits of most significant others. The Tang Band W6-1139SIF 6-1/2" Paper Cone Subwoofer Is very well built. Although it does use a stamped frame for cost reasons, I did not find this an issue. It is vented through the magnet and also under the dustcap and in the voice coil former. These nice touches prevent compression and it is quite apparent when you hear the "slam" this woofer has. It punches well above its weight class. It is obviously not designed for large spaces, but in my rather large 22' X 32' room, it is loud enough for any kind of music I throw at it. There is another thread here about the actual measured TS parameters of this woofer and it is good to know that they are consistantly close to TB's published spec. Mine were very close. I didn't actually use PE's KD boxes for the sub, since I had a pile of MDF in the corner of the garage, but I made the box identical to the PE box dimensions specifically to make sure the PE boxes would work. Based on the build quality of the little satellite boxes, I expect that the PE 300-7062 boxes would be of excellent quality. They should have nice square corners and provide a nice tight fit. It has a round over on the front baffle and if you recess the woofer, it will bite into the round over about an eighth of an inch. This will hardly be noticable and would actually give it a little artisic flare if used without grills. My boxes are exactly the same size, but without the round overs. On the back, I only cut out a hole for the plate amp and did not recess it. The amp has a foam seal already attached and this sealed the amp to the box just fine. I had to cut the hole about an eighth of an inch bigger than the specs say since the width as stated made it too tight to fit the amp in without force. 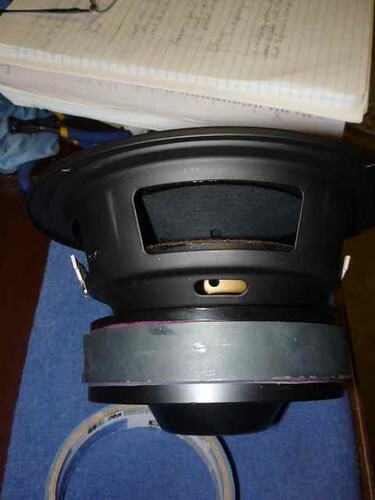 The front baffle was cut with a recess for the woofer. Next, I glued the box together and primed and painted it. I didn't see the need to make any of the baffles removable since removing the amp or speaker gives you total access to the interior. After painting, I first attached the amp. Then I added an 8"X12" piece of convoluted foam with the convoluted side facing away from the amp. I pressed this in so that it was lightly contacting the amp. Since it was slightly larger than the interior of the cabinet, it friction fit nicely and stayed put. I used the foam simply as a barrier to keep the polyester batting from contacting the amp. 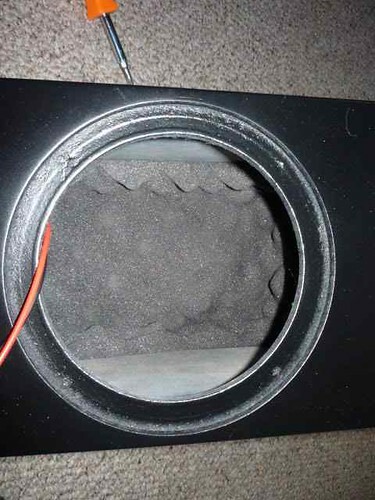 Don't forget to pull the speaker leads under the foam and out to the front of the cabinet. Next, I added a good quantity of polyester batting (sorry, I forgot to get a picture). It was reasonably well packed, but not stuffed to maximum capacity - I think I weighed it and it was about 3 ounces. I then attached the speaker leads from the amp to the woofer and screwed it in. I used #8 X 3/4" screws. The amp speaker leads are apparently made with this woofer in mind since the positive lead had a larger terminal on the end that exactly fit the woofer positive. The negative lead terminal was smaller and likewise exactly fit the speaker negative terminal, so you can't go wrong wiring it up. I'll see how far I can get on the write up for the satellites tomorrow. The 200uF input cap is bypassed with a 0.33uF film and foil cap that PE sells for this purpose. As I said earlier, this bypass cap did seem to make an improvement and its only a little over a dollar, so it is recommended. This input cap combination is a high pass filter at about 65hz and is there to prevent over excursion if it is used alone. You could just as easily use the 0.47 cap, but I had this one on hand and it worked, so that's what I spec'ed. 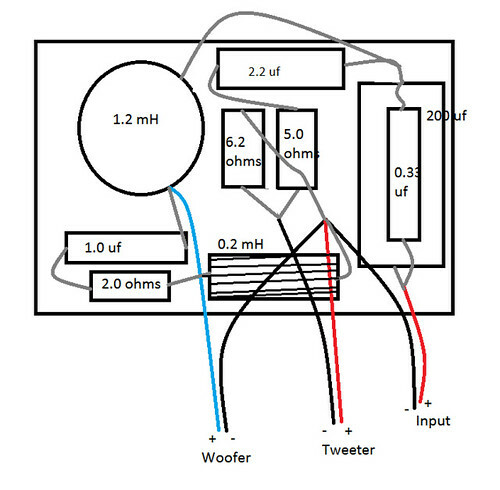 After the input, the signal is split and sent to the woofer and tweeter circuits. Also notice that the tweeter is wired with reversed phase. These pictures were before I added the 0.33 film and foil cap bypass cap across the 200 uF cap input cap, but that's the only difference from the finished XO. But it is a bit tight to get everything on it. 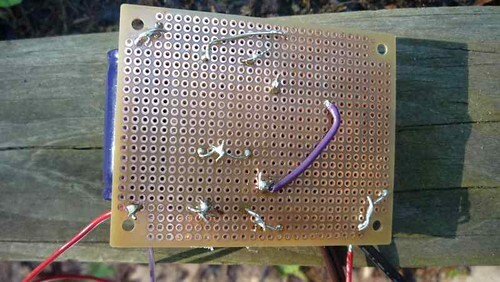 The thing you need to be careful about is the that the wiring can get too close to the mounting holes and the mounting screws could touch the component leads. You can also use the larger sized board, but it is a very close fit for the PE KD boxes. So take your choice - a tight fit on the XO parts or a tight fit in the cabinet. I have a pair of the larger boards and I will make a second set of these, so I'll see how they work out. Next up, construction details and a parts list. 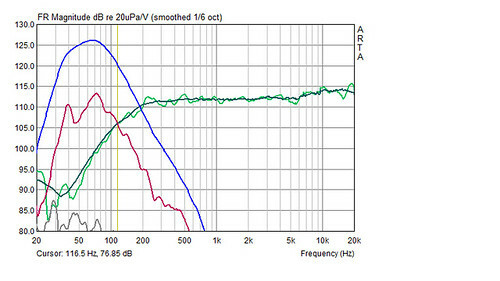 What program did you use to measure frequency response?